It’s been months since my last hike. The reasons don’t matter now. What matters is the backcountry always welcomes you back. Too get back in the game, I chose a day hike with a spectacular reward at the top of the climb. Gregory Bald is a sacred space and with any luck, I would benefit from the off-season and have the place to myself. Gregory Ridge Trail is the most direct route to the Bald this time of year as Parson Branch Rd. is closed for the season. But first, one needs to navigate Cades Cove to the trail head. On Saturday’s, the Cove is closed to motor traffic until 9:00 am so there was no need to get there really early. Traffic, although excruciating (for me), moved along and I was able to get to Forge Creek Road on the back side of the Cove by 10:15. Great! There are no other cars in the parking area. By 10:30, i was under way. It’s December 26 and it’s 73 degrees. 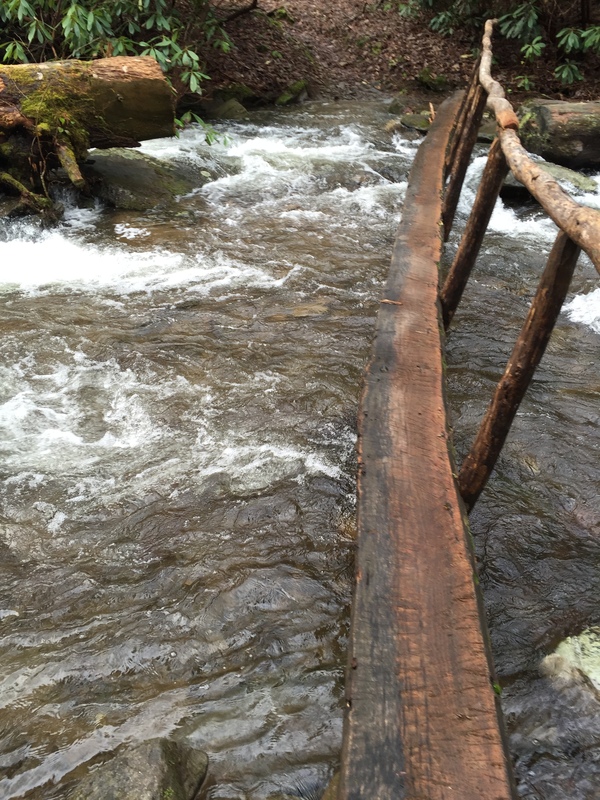 This hike follows several days of rain so all the creeks are swollen. Forge Creek is a class 2 rapids threatening some of the foot logs along the way. The trailhead is at the end of Forge Creek Road, which leads off the Cades Cove Loop road at the Cable Mills Visitor Center. The elevation is 1,955 ft. The first mile of Gregory Ridge Trail is a pleasant stroll on a slight incline as it follows Forge Creek. You cross a few foot bridges until you reach Campsite 12 at about 2.0 miles. After several days of rain, there is high water at every crossing and in some cases, the rapids are within inches of the foot log. Campsite 12 appears to be a bulge in the trail with the fire ring a mere 10 feet within the trail itself. Just past CS 12, the climb begins to increase and will gain over 2,000 ft. over the next 3 miles at a 13.5% grade. At about 2.5 miles, the woods open up to a great view of Sugar Cove Ridge. A little further you can see the first glimpse of Cades Cove. The climb continues steadily to the intersection with Gregory Bald Trail. I finished Gregory Ridge Trail in 2:10 for a pace of 2.3 miles per hour. 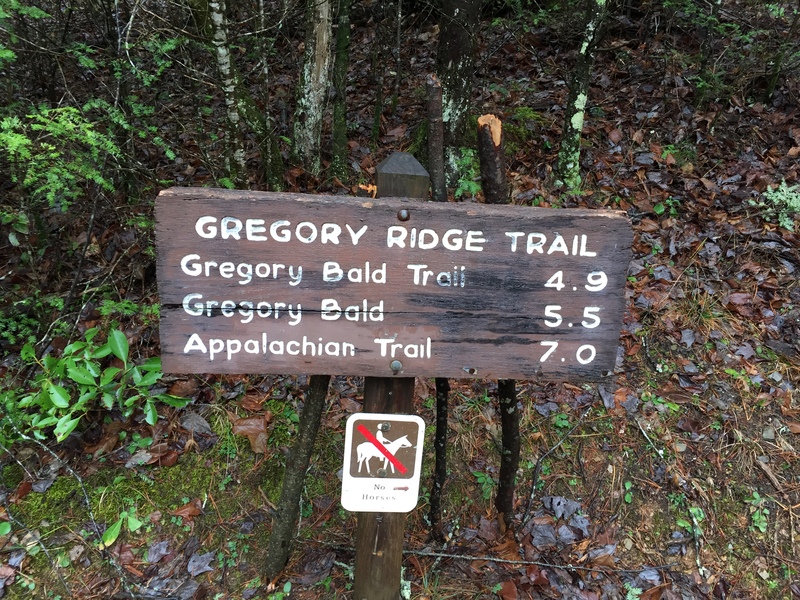 Gregory Bald is 0.5 miles to the right on Gregory Bald Trail. The climb continued until finally, the woods gave way to a grassy summit. The wind was steady and cool although not really cold. At the very summit, there is a benchmark making the elevation along with a very special pine tree that offers some cover from the wind and it is there I had a bite of lunch. I was thrilled to realize that the mountain belonged to me as there were no other hikers around. 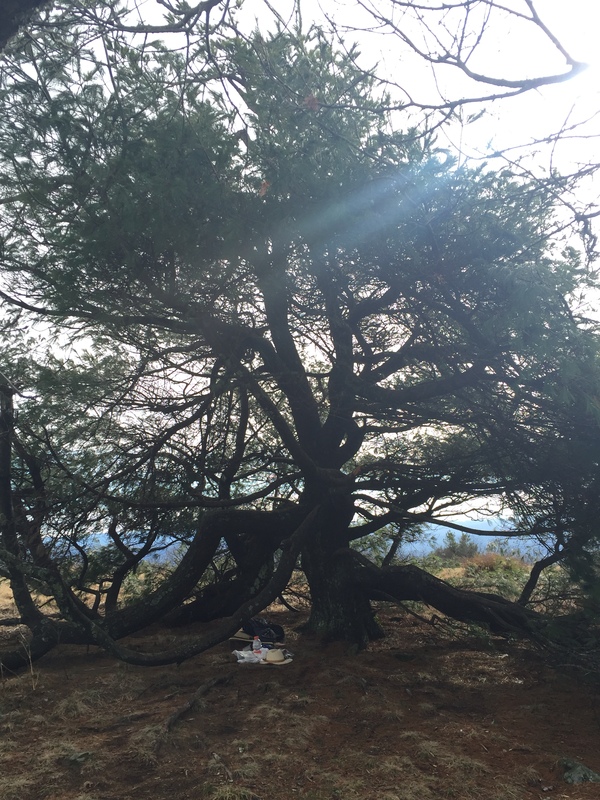 After a rather strenuous hike and a satisfying lunch, I stretched out on the pine needles in the shelter of Old Man Pine and take a short nap. Then it was time to investigate the bald and take pictures. I had planned to spend some time reading John Muir but the wind was a bit uncooperative with regard to such an activity. Nevertheless, I had a time of contemplation while sitting in the grass viewing Cades Cove. I could see the shiny skins of automobiles reflecting the sunlight from miles away. Before I knew it, 1.5 hours had passed and I decided to head back down the way I came. The trip down took 2 hours and by 4:00, I was back in the glacial flow of traffic on the Cades Cove Loop. 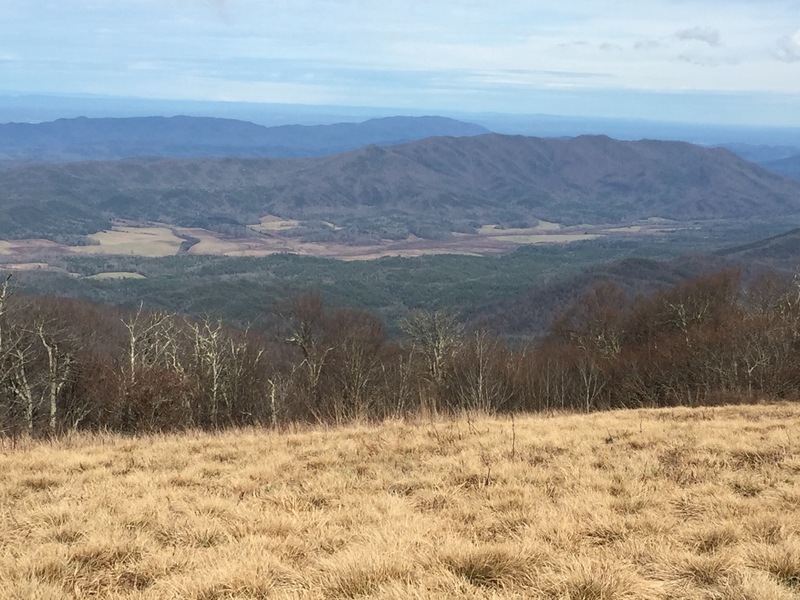 This entry was posted in Trail Log and tagged Gregory Bald, Gregory Ridge Trail on December 27, 2015 by blogginggazelle.